A backup offer is an offer that the seller hasn’t accepted, but is strong enough and close enough to the accepted offer that the seller would like to revisit it should the accepted offer fall through. Neither backup offers nor accepted offers are binding in New York, which means that being a backup offer is really just a nice way of saying that you weren’t the winning bidder. How Often Do Backup Offers Get Accepted? Should You Agree to Be a Backup Offer? Backup offers don’t usually get accepted in NYC. That’s because listing agents generally do a good job in selecting the highest and most qualified bidder, as well as determining who is serious about buying and who is window shopping. With that said, accepted offers don’t mean anything until contracts have been signed, and offers do fall through all the time. Furthermore, because accepted offers nor backup offers mean anything, a backup offer might still not be around by the time a seller comes crawling back to it. The buyer who is the backup offer may be long gone and have an accepted offer on something else! Additionally, there may be multiple backup offers on a house if there was a bidding war or a best and final offer process. As a result, the chances of one backup offer being accepted are quite low even if the primary accepted offer falls through. Remember there are no rules in the Wild West of NYC real estate, and no one is going to require the seller to have one designated backup offer to come back to first. 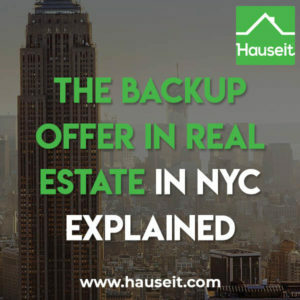 In short, there are no formal or published statistics available on how often do backup offers get accepted in NYC or nationwide. This is because the sale process is confidential and there isn’t a mechanism for sharing this type of information across different brokerages anyway. However, from the experience of our wide network of partner brokers, we can confidently conclude from our sample set that backup offers typically do not get accepted, and that seeing a backup offer get accepted is definitely a more rare scenario. Pro Tip: Read our guide on best and final offer strategy and tactics in NYC so you can win the next bidding war. Don’t let your dream home slip away because of poor bidding war strategy! There’s generally no harm in agreeing to be a backup offer. Since none of it is binding, it doesn’t harm you to agree to this as it’s only option value to you. With that said, you shouldn’t give the listing agent or seller the impression that you are desperately waiting, hat in hand, for them to come back to you. You should thank the listing agent and seller for their time and tell them that you’re happy to be the backup offer and re-consider the deal if it comes back to you; however, you should make it clear that you are viewing and considering other properties and that you may be out of the market soon. Not only is this an honest response that doesn’t lead the seller on, but it may give the sell side a sense of urgency to come back to you quickly if the accepted offer doesn’t seem to be making progress. That’s because even if you are waiting hat in hand for this one and only property, you don’t want the seller to think they can take all the time in the world to flesh out the accepted offer before coming back to you. Pro Tip: Are you lucky enough to be purchasing all cash? If so, make sure you explain to the seller the benefits of accepting a cash offer on a house in NYC and why you should be allowed to take a crack at the contract as well. You can get a head start over the competition by convincing the seller to send out a second contract so your attorney can begin the contract review and due diligence process in parallel with the accepted offer. Though infrequent, this is sometimes allowed by savvy sellers who understand that accepted offers can fall through, and that there are no rules prohibiting sellers from accepting multiple offers and sending out multiple contracts to different buyers. It’s actually a wonder that multiple contract situations don’t happen more often. We think it may actually be because of pure laziness on the part of the listing agents and real estate attorneys serving sellers. Unfortunately for home sellers, it’s just much easier for a listing agent to accept one offer and hope that does the trick. If you’re able to get the seller to accept your offer as well and send your lawyer a contract, then it’s off to the races. The first accepted offer might have a few days head start on you, so your team will need to move quickly to demonstrate to the seller that they made a good decision in letting you take a crack at it as well. In competitive situations with multiple accepted offers, it’s typical for sellers to expect a signed contract within 5 business days or less. As a result, your real estate attorney will need to hustle and review the co-op or condo board meeting minutes, the building’s annual financial statements, the building’s operating budget, the original offering plan and any amendments to it. Your lawyer will also need to order a title search or a coop lien search in addition to reviewing and negotiating the contract on your behalf. If your lawyer gets all of this done quickly, then the seller might just counter-sign your signed contract if the other party is dragging their feet. Be careful however and remember that the seller is last to act, meaning they are only bound by a contract after they have counter-signed it. As a result, there is a risk of last minute shopping by the seller, meaning that they could wave your signed contract around to other interested bidders to see if anyone else would like to improve their offer. Pro Tip: Congrats on getting the seller to send you a contract to review as well! If you’ve just signed it, you’ll need to hand over a good faith deposit, otherwise known as a contract deposit or earnest money. Read our article on the earnest money check for a NYC home purchase to get an overview of how much you’ll have to put down, and whether it’s customary to use a personal check.